Earn $6.69 in Rewards credit. Click to learn more. Shimano's performance XT line enters its 10-speed generation with Dyna-Sys technology. 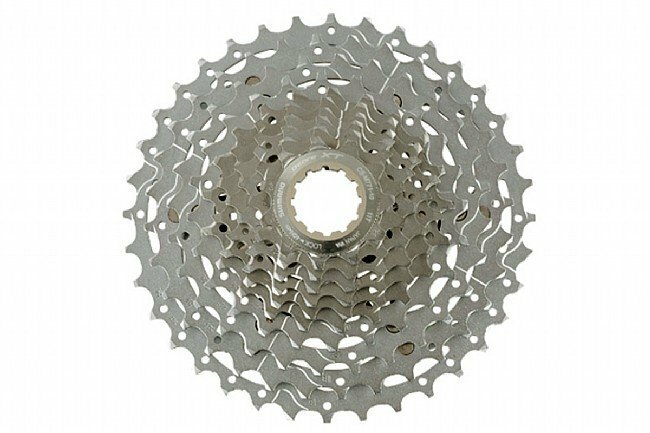 The CS-M771 10-speed cassette features a competition level construction with an emphasis on durability. New 11-36 gear range lets you tackle the steep hills and smash the speedy descents. Tough wearing plated steel sprockets and precision machined HyperGlide tooth profiles offer high mileage and flawless shifting. Drilled out cogs bring the weight down while two alloy carriers hold the largest six cogs (3 cogs per carrier) for even lighter performance and increased rigidity. Optimized for the asymmetric DynaSys HG 10-speed chains. Alloy lockring included. I bought this for an entry level cross bike extra wheelset. It works great so far and didnt cost an arm or a leg. This and the right chainring up front can get you over most anything! The 11T helps when you're picking up speed on the flats while the 36T is like a good friend when the grade kicks in at 22%. Great cassette for our road tandem to help with steep rides. We have the 11-32 tooth cassette set up with an Ultegra long cage derailleur and it works great. 5 of 10 customers found this review helpful. This cassette has given me the lower gears I needed for touring on big climbs. I mounted this on my Giant Anthem 29'er. It shifts smoothly and reasonably quietly. It does what a cassette is supposed to do carry the chain and help it move from cog to cog.